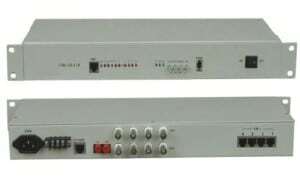 1.25 Gb/s optical 1+1 backup type protection media converter with 1 TX 10/100/1000 type port and 2 SFP type FX uplink ports ,can realize the optical line 1 + 1 redundancy protection in point-to-point mode, it can provide Optical Port automatic protection switching. Ethernet Port Supports Ethernet frame length: 64~9600 bytes packet. 16-slot multifunctional management system is a Ethernet and SDH transmission equipment with high price/performance ratio, and it can support 10/100M Ethernet fiber media converter, 10/100/1000M Ethernet fiber media converter, 1 fiber + 2 RJ45 Ethernet fiber media converter, 10G Ethernet fiber media converter, 125M~4.25G OEO, and 10G OEO at the same time. 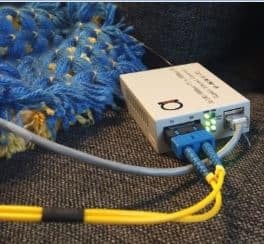 It can support variety of data rate, SM/MM, single fiber/double fiber, SFP, SFP+ and XFP etc. With simple set-up and complete function management interface, it supports protocols like SNMP, WEB, CONSOLE and TELNET, and realizes the integrated management to all chassis. This is 1.25 Gb/s optical transmission equipment ,can realize the optical line 1 + 1 redundancy protection in point-to-point mode, it can provide Optical Port automatic protection switching. This device uses a centralized management platform to monitor and manage the device, it is very convenient. Also supports SNMP. This equipment is high integration, low power consumption, stable performance, easy installation, can be widely used in telecommunications, electricity and financial industries.